I have always wanted to try screen printing, but never found the time to teach myself. This winter I signed up for a class with a friend. The thinking was it would force me to set aside the 3 hours a week so I could focus on it. I haven’t quite finished the class yet, but here are some of the projects I have finished to date. My daughter has a little doll bed on her wish list. I’m holding out until her birthday before buying her any new toys. There are so many toys in our life and in our home we don’t need any coming in “just because.” However, that doesn’t mean I can’t sew a few accessories for it in anticipation of the little bed’s arrival – right? For those of you that have kids who love all things pink and princess-y, this is a project for you! My daughter has been obsessed with mermaids for about six months now. I don’t think it is due to the Disney movie, but who really knows. So I thought I would whip her up a little tail that she could put on her favourite doll. 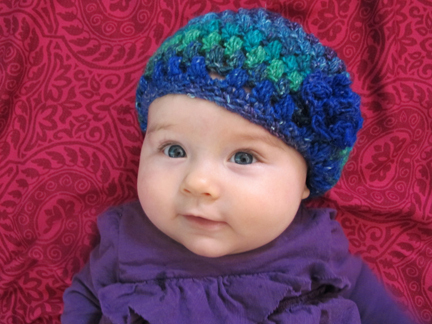 If there’s one thing knitters and crocheters love to make, it’s baby garments. So wee! So quick and rewarding! New babes need to keep their cute little noggins warm, so why not do it in style? This beret is easier to make than it may look and requires only basic crochet skills.The self-striping yarn does all the jazzy work for ya. Why buy it when you can D.I.Y it? We're crafty ladies who also happen to be moms. Check out our ever-expanding archive of awesome projects. Get D.I.Y.-connected with the Motherboards.